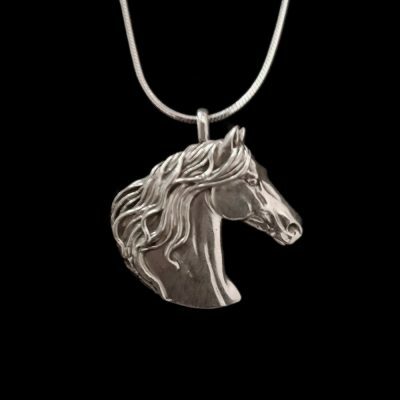 Arabian sterling silver horse head with tassels inside circle on 16″, 18″ , or 20″ sterling silver snake chain. Circle measures 1″ in diameter. 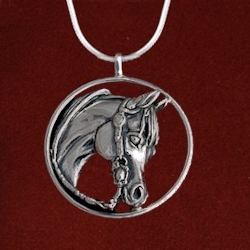 A special piece for the Arabian horse lover. 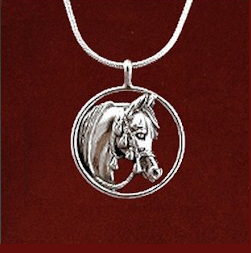 Arabian sterling silver horse head with tassels inside circle on 16″, 18″ , or 20″ sterling silver snake chain. Circle measures 1″ in diameter. Also comes in large size as shown below. 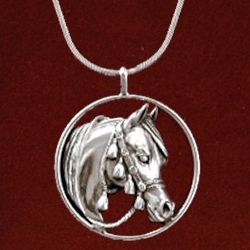 Small size available with 14k head and silver back and circle for $795.00. 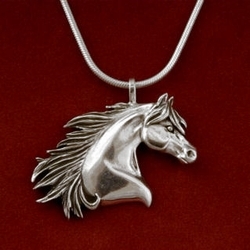 A distinctive, special piece for the Arabian horse lover!